Upcycling and repurposing go hand in hand with garden or yard projects, particularly bird baths and feeders. In fact, I’ve already made quite a few of them. From a hanging bird bath, to a bird bath bowl, to anything you’d hang on a bird feeder bowl, there are TONS of upcycling ideas for your backyard birds. So, to help spark my creative muse, I looked for inspiration and collected a bunch of upcycled bird bath and DIY bird feeder ideas that I wanted to share with you! 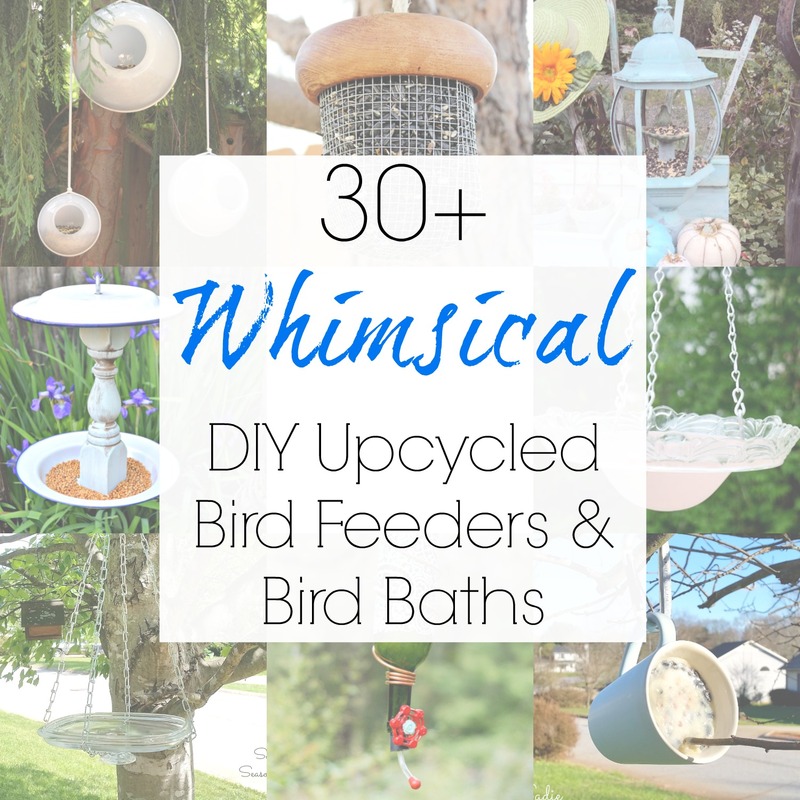 There are some FANTASTIC DIY bird bath ideas and ways to create the best bird feeders out there…now I just need to figure out which kind of upcycling idea I want to work on next. And of course, I would employ bird-friendly ideas like keeping the baths shallow…adding pebbles to make a bath non-slip…and covering bird feeders to keep the seed dry. Think you’ll be making a repurposed bird bath or bird feeder to hang on your bird feeder pole soon? I know I will be! Wonderful ideas Sarah! Thanks so much for including my birdbath among the features. I have done a couple of these before! I plan to have a few feeders and baths in my developing garden. Thanks, Heather Anne- could you send me a link to your party? Wow, how cute and creative! I love these good ideas! What a great mix of feeders – Love the bottles they add character to the great outdoors. These ideas are great! I’d love to make a bird feeder with my son, I think he’d get such a kick out of it! Thanks for linking this up to Merry Monday! Such great ideas! I love bird baths and feeders. We have a window one and it’s awesome to watch the birds come so close. Super cute Ideas!! Thanks for Sharing on My 2 Favorite Things on Thursday!! Hope to see you again this week!! I Pin everything to My 2 Favorite Things Pinterest Board! Great round up! pinned and sharing! Lots of fun ideas! I just found an old light fixture that I will be turning into a feeder. Thanks for sharing with SYC. Great list of ideas! I can’t wait to try some of them. Thanks for sharing at Inspiration Thursday! There are some neat ideas here…maybe even homemade gifts! These are so creative ideas! I hate throwing away left pieces of glassware and here’s a lovely way to up-cycle them. Thanks for the inspiration! 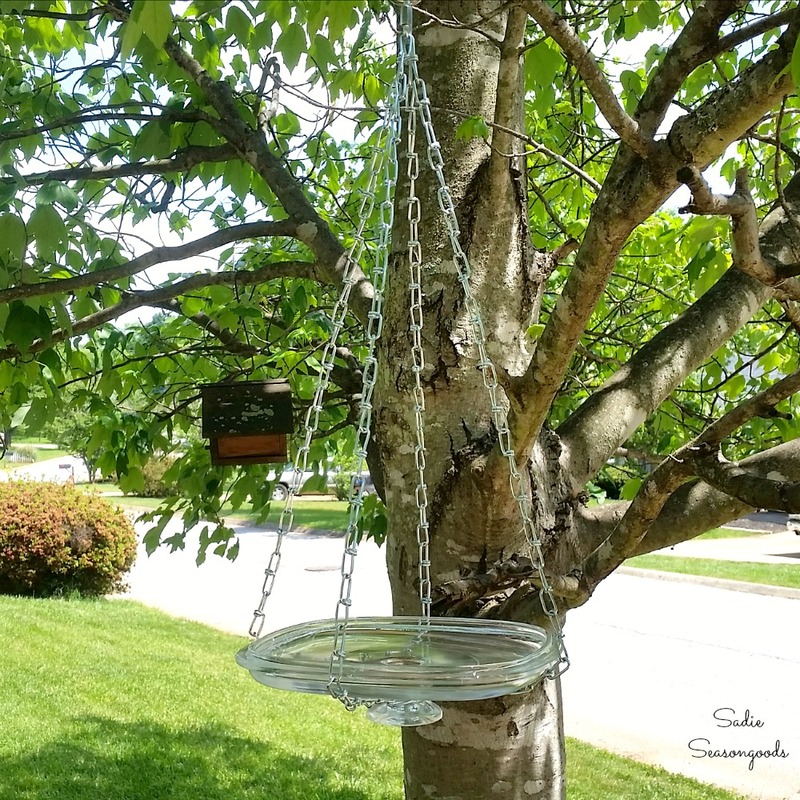 I love some of these ideas – I’m a big bird feeder person and am always replacing the ones those darned squirrels get at!~ and always looking for new feeders. What great ideas! My parents love watching the birds in their yard. You have inspired me to re-purpose something for them soon! No shortage of creativity here! Our feeder is pretty boring compared to these but now I have lots of ideas. We had a water feeder/trough on the deck and it was fine until the crows decided it was a good idea to wash their food in it. The last straw was when I seen one washing a recently hatched baby bird. After that it had to go. Super cute and so creative. it is amazing how many things can be transformed. Thanks for sharing this at DI&DI. Instead of the chain i used a bunch of bright colored macrame rope that i have had for a few years but refused to throw out. I called on my macrame skills of yesteryear. I attached it to a ring i found in a clearance bin and did one simple knot repeatedly, i also ruffed up the rope or more or less frayed it in a few places, making it easily accessible for nest building supplies. it was easier to.spot my feathered friends and they could knock off two chores by having a drink and picking up something special for their home. I also made small blocks of ice in old containers with no matching lid and placed them in the bath a few times a day to keep the water cool and inviting.